Received: October 16, 2018; Revised: November 4, 2018; Accepted: November 6, 2018; Published online: November 27, 2018. Oxidative stress is considered a major contributor in the pathogenesis of diabetic neuropathy and in diabetes complications, such as nephropathy and cardiovascular diseases. Diabetic neuropathy, which is the most frequent complications of diabetes, affect sensory, motor, and autonomic nerves. This study aimed to investigate whether 7,8-dihydroxyflavone (7,8-DHF) protects SH-SY5Y neuronal cells against high glucose-induced toxicity. In the current study, we found that diabetic patients exhibited higher lipid peroxidation caused by oxidative stress than healthy subjects. 7,8-DHF exhibits superoxide anion and hydroxyl radical scavenging activities. High glucose-induced toxicity severely damaged SH-SY5Y neuronal cells, causing mitochondrial depolarization; however, 7,8-DHF recovered mitochondrial polarization. Furthermore, 7,8-DHF effectively modulated the expression of pro-apoptotic protein (Bax) and anti-apoptotic protein (Bcl-2) under high glucose, thus inhibiting the activation of caspase signaling pathways. These results indicate that 7,8-DHF has antioxidant effects and protects cells from apoptotic cell death induced by high glucose. Thus, 7,8-DHF may be developed into a promising candidate for the treatment of diabetic neuropathy. Hyperglycemia plays an important role in the development of serious complications such as diabetic neuropathy, nephropathy, and retinopathy (Rahimi-Madiseh et al., 2016). Diabetic neuropathy is a serious consequence of prolonged exposure to high glucose that leads to neuronal damage, resulting in neuronal and neural diabetic complications (Shakeel, 2015). Glucose neurotoxicity in patients with diabetes may be due to oxidative stress, which is promoted by free radical generation and impaired free radical scavenging (Babizhayev et al., 2015). Hyperglycemia has been shown to activate a number of glucose metabolism pathways that are implicated in the development of neuropathy, in both in vitro and in vivo models of diabetes (Rahimi-Madiseh et al., 2016). Apoptosis has been suggested as a possible mechanism for high glucose-induced neuronal cell death. It has been established that apoptosis contributes to neuronal loss in most neurodegenerative diseases (Waldmeier and Tatton, 2004). Two major apoptotic pathways have been identified: the death receptor-mediated pathway and the mitochondrial apoptotic pathway. The mitochondrial pathway involves a release of mitochondrial apoptotic proteins, such as cytochrome c (Lee and Lee, 2018). Although the mechanism underlying the release of mitochondrial apoptotic proteins remains unclear, B cell lymphoma-2 (Bcl-2) family members play a central role in regulating mitochondrial outer membrane permeability (Dai et al., 2016). Apoptosis occurs when pro-apoptotic proteins, such as Bcl-2-associated X protein (Bax) and Bcl-2 homologous antagonist killer, bind to the mitochondrial outer membrane, where they initiate changes in mitochondrial outer membrane permeability (Czabotar et al., 2014; Liu et al., 2018). Flavonoids are natural polyphenolic compounds found in fruits, vegetables, and tea. Growing evidence shows that some flavonoids are neuroprotective, although the underlying mechanisms are not fully understood. Recently, 7,8-dihydroxyflavone (7,8-DHF), a member of the flavonoid family, has been identified as a selective tropomyosin receptor kinase B agonist, and it provides protection against neuronal injury involved in Parkinson’s disease, Alzheimer’s disease, and stroke (Yang et al., 2014). In this study, we explored the antioxidant and cytoprotective effects of 7,8-DHF against high glucose-induced cytotoxicity in SH-SY5Y neuronal cells and investigated the underlying mechanisms. 7,8-DHF was purchased from Tokyo Chemical Industry Co. (Chuo-ku, Tokyo, Japan) and was dissolved in dimethyl sulfoxide (DMSO). The final concentration of DMSO did not exceed 0.02%. 5,5-Dimethyl-1-pyrroline-N-oxide (DMPO), 2′,7′-dichlorofluorescin diacetate (DCF-DA), and Hoechst 33342 were purchased from Sigma-Aldrich (St. Louis, MO, USA). 5,5′,6,6′-Tetrachloro-1,1′,3,3′-tetraethyl-benzimidazolylcarbocyanine iodide (JC-1) was purchased from Invitrogen (Carlsbad, CA, USA). Primary antibodies against Bax and Bcl-2 were purchased from Santa Cruz Biotechnology (Santa Cruz, CA, USA). Primary antibodies against caspase 9 and caspase 3 antibodies were purchased from Cell Signaling Technology (Beverly, MA, USA). SH-SY5Y neuronal cells were grown in Dulbecco’s modified Eagle’s medium supplemented with 10% fetal bovine serum, 100 U/ml penicillin, and 100 U/ml streptomycin. The cells were maintained at 37°C in a humidified atmosphere of 5% CO2, and were cultured in polystyrene tissue culture dishes. The medium was changed every other day and the cells were plated at an appropriate density for each experiment. The human bio-specimens used in this study were provided by the Jeju National University Hospital Biobank, a member of the National Biobank of South Korea supported by the Ministry of Health and Welfare. All samples were obtained with written informed consent, according to the Institutional Review Board (IRB) protocol (No. 2014-10-004), which was approved by the Institutional Review Board of the Jeju National University. Blood samples were obtained from 10 patients with type 2 diabetes mellitus (T2DM) and 10 healthy volunteers. Blood was allowed to clot for 30 min before centrifugation at 1,000×g. Separated serum samples were stored at –70°C until assayed for 8-isoprostane by enzyme-linked immunosorbent assay (ELISA) (Cayman chemical, Ann Arbor, MI, USA). Briefly, 100 μl of standards and serum samples were placed in a 96-well plate that was pre-coated with a polyclonal antibody against 8-isoprostane. 8-Isoprostane in the sample or an alkaline phosphatase molecule covalently bound to 8-isoprostane was allowed to bind in a competitive manner. After simultaneous incubation at room temperature, excess reagents were washed away and substrate was added. After a 1 h incubation, the enzyme reaction was stopped and the generated yellow color was measured on a microplate reader at 405 nm. The effect of 7,8-DHF on the viability of SY-SH5Y cells was determined by 3-(4,5-dimethylthiazol-2-yl)-2,5-diphenyltetrazolium bromide (MTT) assay, which is based on the cleavage of the tetrazolium salt by mitochondrial dehydrogenase in viable cells (Kim et al., 2016). Cells were seeded in a 96-well plate at a concentration of 1×105 cells/ml and cultured for 16 h. Then, the cells were treated with 7,8-DHF at 5 μg/ml and N-acetylcysteine (NAC), a ROS scavenger, at 2 mM. One hour later, 150 μM of glucose was added to the plate and cells were incubated for an additional 24 h at 37°C. Fifty microliters of MTT stock solution (2 mg/ml) was then added to each well (total reaction volume: 200 μl). After 4 h of incubation, the plate was centrifuged at 800×g for 5 min and the supernatants were aspirated. The formazan crystals in each well were dissolved in 150 μl DMSO and the absorbance at 540 nm was measured by using a scanning multi-well spectrophotometer (Sunrise, Tecan, Maennedorf, Switzerland). Superoxide anions generated by the xanthine-xanthine oxidase system and hydroxyl radicals generated by the Fenton reaction (H2O2+FeSO4) were reacted with DMPO. The resultant DMPO/•OOH and DMPO/•OH adducts were measured using a JES-FA200 electron spin resonance (ESR) spectrometer (JEOL Ltd., Tokyo, Japan) (Kimura et al., 2016). The ESR spectrometer parameters were set as described previously (Cha et al., 2014). To detect intracellular ROS, the DCF-DA method was used. DCF-DA diffuses into cells, where it is hydrolyzed to polar 2′,7′-dichlorodihydrofluorescein by intracellular esterase. This non-fluorescent fluorescein analog is trapped inside the cells and can be oxidized to the strongly fluorescent 2′,7′-dichlorofluorescein by intracellular oxidants (Anil Kumar et al., 2018). SY-SH5Y cells were seeded in a 96-well plate at 1×105 cells/ml and were treated with 5 μg/ml of 7,8-DHF 16 h after seeding. Thirty minutes later, 150 μM of glucose was added to the plate. The cells were incubated for an additional 30 min at 37°C. The fluorescence of 2′,7′-dichlorofluorescein was detected at 485 nm excitation and 535 nm emission using a PerkinElmer LS-5B spectrofluorometer. The intracellular ROS scavenging activity (%) was calculated as [(optical density of glucose)–(optical density of glucose with 7,8-DHF treatment)]/(optical density of glucose)×100. In addition, intracellular ROS were analyzed by confocal microscopy after staining with DCF-DA (Carl Zeiss, Oberkochen, Germany). Chromosome staining of SH-SY5Y cells was performed using Hoechst 33342. Briefly, cells were washed with PBS and then fixed with methanol at 37°C for 15 min. Hoechst 33342 (1 μg/ml) was added to each well and the cells were further incubated at 37°C for 30 min in the dark. Control and apoptotic SH-SY5Y cells were visualized under a fluorescence microscope equipped with a CoolSNAP-Pro color digital camera to examine the degree of nuclear condensation (Park et al., 2017). The mitochondrial membrane potential Δψm was determined by confocal image analysis and flow cytometry. SY-SH5Y cells were treated with 7,8-DHF at 5 μg/ml for 1 h. Then, 150 μM of glucose was added to the plate and the mixture was incubated for 24 h. After refreshing the media, JC-1 was added to each well and the cells were incubated for an additional 30 min at 37°C. After washing with phosphate-buffered saline (PBS), the stained cells were mounted onto microscope slides in mounting medium (DAKO, Carpinteria, CA, USA). Microscopic images were captured on a confocal microscope using the Laser Scanning Microscope 5 PASCAL program (Carl Zeiss, Jena, Germany). For flow-cytometric measurement of Δψm, cells were harvested, washed, and suspended in PBS containing JC-1 (10 μg/ml). After incubation at 37°C for 15 min, the cells were washed, suspended in PBS, and analyzed by flow cytometry (BD FACSCalibur, Becton Dickinson, San Jose, CA, USA). SY-SH5Y cells were seeded in a culture plate at 1×105 cells/ml. Sixteen hours after plating, the cells were treated with 5 μg/ml 7,8-DHF. At indicated times, the cells were harvested and washed twice with PBS. Then harvested cells were lysed on ice in 100 μl of lysis buffer [120 mM NaCl, 40 mM Tris (pH 8), 0.1% NP 40] for 30 min and centrifuged at 13,000×g for 15 min. Supernatants were collected and protein concentrations in the lysates were determined by Bradford protein assay. Aliquots of the lysates (40 μg of protein) were boiled for 5 min and electrophoresed in a 10% sodium dodecyl sulfate-polyacrylamide gel. Proteins were transferred onto nitrocellulose membranes (Bio-Rad, Hercules, CA, USA), which were then incubated with the primary antibodies (diluted 1:1000) over-night at 4°C. Then, the membranes were incubated with secondary immunoglobulin G horseradish peroxidase conjugates (Pierce, Rockford, IL, USA) and exposed to X-ray film. Protein bands were detected using an enhanced chemiluminescence western blotting detection kit (Biosciences, Amersham, Buckinghamshire, UK). Serum 8-isoprostane levels in patients with T2DM (median 366 pg/ml; range 364-368 pg/ml) were significantly higher than those in healthy controls (median 221 pg/ml; range 207–237 pg/ml; Fig. 1). Remarkably, 100% (10/10) of the patients with T2DM exhibited elevated 8-isoprostane levels, while none of the healthy individuals (n=10) showed increased levels. Thus, the 8-isoprostane level might discriminate patients with T2DM from healthy controls. The finding that there was a significant association between T2DM and 8-isoprostane levels suggests that oxidative stress is related to diabetes. The effect of different concentrations of glucose on SH-SY5Y cell viability was assessed to determine the concentration of glucose that resulted in a 50% reduction in cell viability (IC50 value). Following 24 h incubation of SH-SY5Y cells (1×104 cells/well) with 0–200 μM glucose, cell viability significantly declined in a dose-dependent manner. The IC50 was determined as 150 μM (Fig. 2A), and was used as high glucose level in further experiments. In an MTT-based cytotoxicity assay of 7,8-DHF (Fig. 2B) at various doses in SH-SY5Y cells, 10 μg/ml of 7,8-DHF was found to be cytotoxic. Thus, 7,8-DHF was used at 5 μg/ml for pretreatment (Fig. 2C). The 7,8-DHF protective effect on cell survival was assessed using high glucose-treated SH-SY5Y cells. Cells were treated with 7,8-DHF at 5 μg/ml for 24 h prior to the addition of 150 μM of glucose. Cell viability was determined 24 h later by MTT assay. As shown in Fig. 2D, cells treated with 5 μg/ml 7,8-DHF alone had a survival rate of 102% compared to 100% for non-treated control cells, indicating that 7,8-DHF at this concentration was not cytotoxic for SH-SY5Y cells. 7,8-DHF at 5 μg/ml increased the cell survival rate of 49% of high glucose-treated cells to 64%. To determine whether 7,8-DHF scavenges ROS, we measured superoxide anions and hydroxyl radicals by ESR spectrometry. We observed superoxide anion signals of 1,575 in the absence of 7,8-DHF and of 1,157 in the presence of 7,8-DHF (Fig. 3A). Hydroxyl radical signals were 2,531 in the absence of 7,8-DHF and 2,232 in its presence (Fig. 3B). These results suggested that 7,8-DHF directly scavenges ROS. To determine the role of ROS in mediating glucose toxicity, intracellular ROS levels in SH-SY5Y cells were measured using DCF-DA as an indicator. Flow cytometry revealed a fluorescence intensity of 184 for high glucose-treated cells pretreated with 5 μg/ml 7,8-DHF compared to a fluorescence intensity of 347 in glucose-treated cells (Fig. 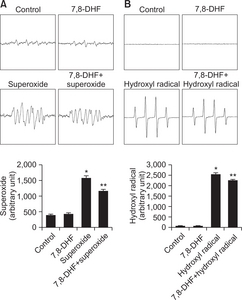 4A), suggesting that 7,8-DHF suppresses high glucose-induced ROS generation. Confocal microscopy revealed that glucose treatment increased the intracellular ROS level, which was suppressed by 5 μg/ml 7,8-DHF (Fig. 4B). These data suggested that 7,8-DHF scavenges intracellular ROS. To evaluate whether high glucose acts by inducing apoptosis and the cytoprotective effects of 7,8-DHF are related to inhibiting this process, SH-SY5Y cell nuclei were stained with Hoechst 33342 and analyzed by microscopy. As shown in Fig. 5A, control cells had intact nuclei, where high glucose-treated cells showed significant nuclear fragmentation, which is indicative of apoptosis. However, pretreatment of glucose-treated cells with 5 μg/ml 7,8-DHF suppressed nuclear fragmentation. Δψm was examined to assess mitochondrial involvement in the protective effect of 7,8-DHF against high glucose-induced apoptosis. Mitochondria are instrumental in oxidative phosphorylation, cell death regulation, and ROS production (Orrenius et al., 2007). As shown in Fig. 5B, control cells and 7,8-DHF-treated cells exhibited strong red fluorescence (JC-1 in aggregated form) in the mitochondria, indicating mitochondrial polarization. However, high glucose treatment resulted in reduced red fluorescence and increased green fluorescence (JC-1 in monomer form) in mitochondria, indicating mitochondrial depolarization. Flow cytometry data confirmed that Δψm loss was increased in glucose-treated cells, as indicated by an increase in JC-1 fluorescence as compared to non-treated cells, whereas 7,8-DHF inhibited this glucose-induced loss of Δψm (Fig. 5C). To better understand the protective mechanism of 7,8-DHF against glucose-induced apoptosis, the expression of proteins involved in mitochondria-related apoptosis was investigated. First, we examined the expression of Bcl-2, an anti-apoptotic protein, and Bax, a pro-apoptotic protein. As shown in Fig. 5D, 7,8-DHF treatment induced an increase in Bcl-2 expression and a decrease in Bax expression in glucose-treated cells. Next, caspase-9 and caspase-3 expression was examined by western blotting as these enzymes are activated by mitochondrial membrane disruption (Perkins et al., 2000). As shown in Fig. 5E, 7,8-DHF treatment inhibited glucose-induced active form of caspase-9 (37 and 35 kDa) and caspase-3 (19 and 17 kDa), a target of caspase-9. Oxidative stress plays a pivotal role in cellular injury induced by hyperglycemia. A high glucose level can stimulate free radical production. A weak defense system is unable to counteract the enhanced ROS generation and, as a result, an imbalance occurs, which leads to oxidative stress (Parsaeyan and Zavarreza, 2016). In the present study, we demonstrated that 7,8-DHF dramatically inhibited high glucose-induced cell death, apoptosis, and mitochondrial dysfunction. The protective effect of 7,8-DHF might be attributed to its powerful anti-oxidant action, as evidenced by a marked reduction in intra-cellular ROS. SH-SY5Y, a neuronal cell line, is commonly used to study diabetic neuropathy (Fernandes et al., 2018). These cells, when treated with high glucose, show effects similar to those observed in dorsal root ganglia neurons and Schwann cells (Vincent et al., 2002). In addition, SH-SY5Y cells have been successfully used to demonstrate changes in signal transduction (Hattangady and Rajadhyaksha, 2009). Pathways that lead to abnormal nitric oxide production and changes in Na+/K+ pump activity have also been studied in this cell line (Suhail, 2010). Neuroblastoma cells have been extensively used to screen the efficacy of uncouplers (Vincent et al., 2002) and insulin-like growth factor-1 (Leinninger et al., 2004) as neuro-protectants, and to investigate their mechanism of action. Therefore, high glucose-treated SH-SY5Y cells provide a suitable cell model to investigate antioxidant activity of 7,8-DHF. Hyperglycemia causes tissue damage through multiple mechanisms, including increased flux of glucose and other sugars through the polyol pathway, increased intracellular formation of advanced glycation end products (AGEs), increased expression of the receptor for AGEs and its activating ligands, activation of protein kinase C isoforms, and upregulation of the hexosamine pathway (Brownlee, 2005). Excess glucose can be converted to sorbitol by aldose reductase (Berrone et al., 2006). This first step in the polyol pathway is linked to the oxidation of NADPH to NADP+. This leads to depletion of NADPH, which is needed for regenerating glutathione. Thus, early after the induction of diabetes, metabolic defects lead to loss of NADPH, which limits the ROS scavenging ability of nerve cells, creating a vicious cycle of oxidative stress. Sorbitol accumulation can also result in cellular osmotic stress that may alter the antioxidant potential of the cell and increase ROS production (Obrosova et al., 2003). Aldose reductase inhibitors that penetrate the nerve, decrease nerve sorbitol levels. One clinical trial provided evidence of enhanced axonal regeneration (Barski et al., 2008). In this study, high glucose treatment increased the level of intracellular ROS in SH-SY5Y cells compared to control cells. However, treatment with 7,8-DHF at 5 μg/ml attenuated the glucose-induced ROS increase. Recent evidence suggests that oxidative stress is responsible for the development and progression of neuropathy (Stevens et al., 2000). Blocking oxidative stress in diabetic animals prevents the development of neuropathy and restores sciatic and saphenous nerve conduction velocities in streptozotocin-induced diabetic rats (Vincent et al., 2002; Obrosova, 2009). Our data indicate that increased concentrations of glucose rapidly induced ROS production, which was attenuated by 7,8-DHF. In turn, 7,8-DHF reduced high glucose-induced mitochondrial membrane depolarization and blocked the induction of caspase cleavage. This most likely resulted from the ability of 7,8-DHF to reduce ROS generation and to stabilize Δψm. Both in vivo and in vitro, mitochondrial swelling is observed in dorsal root ganglion neurons and Schwann cells exposed to high glucose and, ultimately, Δψm is decreased, an event that, in other paradigms, initiates programmed cell death (Winseck and Oppenheim, 2006; Gumy et al., 2008; Martin, 2010). It has been shown that release of cytochrome c into the cytosol is associated with the formation of a cytochrome c/caspase 9/Apaf-1 complex (the apoptosome) and cleavage of down-stream effector caspases, such as caspase 3 and caspase 7 (Cheng and Zochodne, 2003). In human and rat neurons, hyperglycemia induces mitochondrial dysfunction and apoptosis, and similar changes are observed in Schwann cells, another important cell type in the peripheral nervous system (Cao et al., 2012; Peng et al., 2016). Increases in caspase 9 cleavage and caspase 3 cleavage have been observed in cultured Schwann cells derived from 12-month diabetic rats and exposed to high glucose. Similar to the changes observed in rat neurons, human Schwann cells show evidence of both mitochondrial swelling and apoptosis when cultured in the presence of high glucose (Cheng and Zochodne, 2003; Cao et al., 2012; Peng et al., 2016). In our present study, high glucose treatment increased mitochondrial depolarization caused by loss of mitochondrial membrane potential in SH-SY5Y cell, whereas 7,8-DHF inhibited this glucose-induced loss of Δψm (Fig. 5B, 5C). In addition, high glucose induced mitochondria-related apoptosis through induction of Bax expression and reduction of Bcl-2 expression in SH-SY5Y cells (Fig. 5D). In summary, 7,8-DHF effectively protected SH-SY5Y cells against high glucose-induced apoptosis through its antioxidant action. 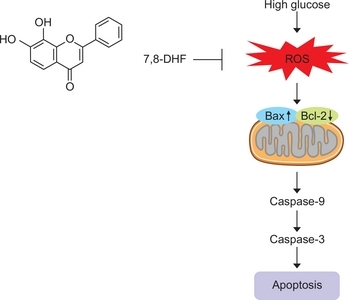 By ROS scavenging, 7,8-DHF markedly inhibited high glucose-induced oxidative injury, preventing mitochondrial dysfunction and apoptosis (Fig. 6). Our study suggests that 7,8-DHF is a promising agent for the treatment of diabetic neuropathy. This work was supported by grant from the Basic Research Laboratory Program (NRF-2017R1A4A1014512) by the National Research Foundation of Korea (NRF) grant funded by the Korea government (MSIP). Fig. 1. Serum 8-isoprostane levels in patients with T2DM and healthy controls. Serum levels of 8-isoprostane were determined by 8-isoprostane ELISA. *p<0.05. Fig. 2. Glucose cytotoxicity in SH-SY5Y cells. (A) Dose–response curve. SH-SY5Y cells (1×105 cells/well) were incubated with 0–200 μM glucose for 24 h, and cell viability was determined by the MTT reduction assay. Values are the percentages of viable cells, with the viability of non-treated control cells set as 100%. *p<0.05 vs="" control="" group="" b="" chemical="" structure="" of="" 7="" 8-dihydroxyflavone="" c="" the="" effect="" of="" 7="" 8-dhf="" on="" sh-sy5y="" cell="" viability="" was="" determined="" by="" mtt="" assay="" d="" the="" effect="" of="" 7="" 8-dhf="" on="" high="" glucose-induced="" cytotoxicity="" in="" sh-sy5y="" cells="" was="" determined="" by="" mtt="" assay="" sup="">*p<0.05 vs="" control="" group="" sup="">**p<0.05 vs. glucose group. Fig. 3. Antioxidant effect of 7,8-DHF. (A) The DMPO-•OOH generated by superoxide anion and DMPO were detected by ESR spectrometry. *p<0.05, **p<0.05 compared="" to="" control="" and="" superoxide="" anion="" respectively="" b="" the="" dmpo-="" oh="" generated="" by="" hydroxyl="" radical="" and="" dmpo="" were="" detected="" by="" esr="" spectrometry="" sup="">*p<0.05, **p<0.05 compared to control and hydroxyl radical, respectively. Fig. 4. 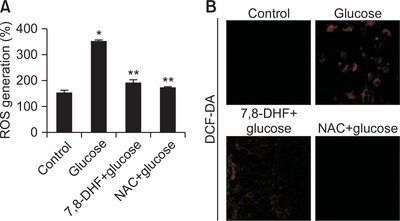 Effect of 7,8-DHF on high glucose-induced intracellular ROS generation. Intracellular ROS were detected by (A) flow cytometry and (B) confocal microscopy after DCF-DA treatment. The representative confocal images illustrate the increase in red fluorescence intensity of DCF produced by ROS (original magnification, 400×). *p<0.05 vs="" control="" group="" sup="">**p<0.05 vs. glucose group. Fig. 5. Effect of 7,8-DHF on glucose-induced apoptosis. (A) Apoptotic body formation was observed by fluorescence microscopy after Hoechst 33342 staining. Apoptotic bodies are indicated with white arrows. Apoptotic body formation was quantified on the basis of microscopy images. *p<0.05 vs="" control="" group="" sup="">**p<0.05 vs="" glucose="" group="" the="" mitochondrial="" membrane="" potential="" was="" analyzed="" by="" b="" confocal="" microscopy="" and="" c="" flow="" cytometry="" after="" jc-1="" staining="" sup="">*p<0.05 vs="" control="" group="" sup="">**p<0.05 vs="" glucose="" group="" cell="" lysates="" were="" electrophoresed="" and="" d="" bax="" bcl-2="" e="" cleaved="" active="" caspase="" 9="" caspase="" 3="" as="" well="" as="" actin="" were="" detected="" by="" western="" blotting="" using="" specific="" antibodies="" sup="">*,#p<0.05 vs="" control="" group="" sup="">**,##p<0.05 vs. glucose group. Fig. 6. Schematic overview of the effect of 7,8-DHF on high glucose-induced apoptosis. 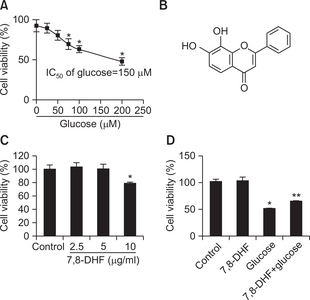 7,8-DHF inhibits apoptosis and mitochondrial dysfunction induced by high glucose through its antioxidant action, including free radical scavenging. Anil Kumar, D, Natarajan, S, Bin Omar, NAM, Singh, P, Bhimani, R, and Singh, SS (2018). Proteomic changes in chick brain proteome post treatment with lathyrus sativus neurotoxin, β-N-oxalyl-L-α,β-diaminopropionic acid (L-ODAP): a better insight to transient neurolathyrism.. Toxicol. Res. 34, 267-279. Babizhayev, MA, Strokov, IA, Nosikov, VV, Savel’yeva, EL, Sitnikov, VF, Yegorov, YE, and Lankin, VZ (2015). The role of oxidative stress in diabetic neuropathy: generation of free radical species in the glycation reaction and gene polymorphisms encoding antioxidant enzymes to genetic susceptibility to diabetic neuropathy in population of type I diabetic patients.. Cell Biochem. Biophys. 71, 1425-1443. Barski, OA, Tipparaju, SM, and Bhatnagar, A (2008). The aldo-keto reductase superfamily and its role in drug metabolism and detoxification.. Drug Metab. Rev. 40, 553-624. Berrone, E, Beltramo, E, Solimine, C, Ape, AU, and Porta, M (2006). Regulation of intracellular glucose and polyol pathway by thiamine and benfotiamine in vascular cells cultured in high glucose.. J. Biol. Chem. 281, 9307-9313. Brownlee, M (2005). The pathobiology of diabetic complications: a unifying mechanism.. Diabetes. 54, 1615-1625. Cao, M, Jiang, J, Du, Y, and Yan, P (2012). Mitochondria-targeted antioxidant attenuates high glucose-induced P38 MAPK pathway activation in human neuroblastoma cells.. Mol. Med. Rep. 5, 929-934. Cha, JW, Piao, MJ, Kim, KC, Yao, CW, Zheng, J, Kim, SM, Hyun, CL, Ahn, YS, and Hyun, JW (2014). The polyphenol chlorogenic acid attenuates UVB-mediated oxidative stress in human HaCaT keratinocytes.. Biomol. Ther. (Seoul). 22, 136-142. Cheng, C, and Zochodne, DW (2003). Sensory neurons with activated caspase 3 survive long term experimental diabetes.. Diabetes. 52, 2363-2371. Czabotar, PE, Lessene, G, Strasser, A, and Adams, JM (2014). Control of apoptosis by the BCL-2 protein family: implications for physiology and therapy.. Nat. Rev. Mol. Cell Biol. 15, 49-63. Dai, H, Meng, XW, and Kaufmann, SH (2016). BCL2 family, mitochondrial apoptosis, and beyond.. Cancer Transl. Med. 2, 7-20. Fernandes, LS, Dos Santos, NAG, Emerick, GL, and Dos Santos, AC (2018). The antidiabetic drug liraglutide minimizes the non-cholinergic neurotoxicity of the pesticide mipafox in SH-SY5Y cells.. Neurotox. Res. Gumy, LF, Bampton, RT, and Tolkovsky, AM (2008). 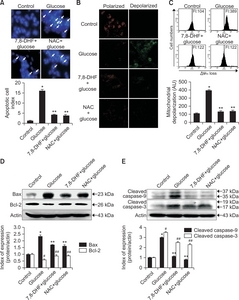 Hyperglycemia inhibits Schwann cell proliferation and migration and restricts regeneration of axons and Schwann cells from adult murine DRG.. Mol. Cell Neurosci. 37, 298-311. Hattangady, NG, and Rajadhyaksha, MS (2009). A brief review of in vitro models of diabetic neuropathy.. Int. J. Diabetes Dev. Ctries. 29, 143-149. Kim, H, Choi, J, Lee, H, Park, J, Yoon, BI, Jin, SM, and Park, K (2016). Skin corrosion and irritation test of nanoparticles using reconstructed three-dimensional human skin model, EpiDermTM.. Toxicol. Res. 32, 311-316. Kimura, S, Inoguchi, T, Yamasaki, T, Yamato, M, Ide, M, Sonoda, N, Yamada, K, and Takayanagi, R (2016). A novel DPP-4 inhibitor teneligliptin scavenges hydroxyl radicals: in vitro study evaluated by electron spin resonance spectroscopy and in vivo study using DPP-4 deficient rats.. Metabolism. 65, 138-145. Lee, W, and Lee, DG (2018). Reactive oxygen species modulate itraconazole-induced apoptosis via mitochondrial disruption in Candida albicans.. Free Radic. Res. 52, 39-50. Leinninger, GM, Russell, JW, van Golen, CM, Berent, A, and Feldman, EL (2004). Insulin-like growth factor-I regulates glucose-induced mitochondrial depolarization and apoptosis in human neuroblastoma.. Cell Death Differ. 11, 885-896. Liu, Q, Cao, Y, Zhou, P, Gui, S, Wu, X, Xia, Y, and Tu, J (2018). Panduratin A inhibits cell proliferation by inducing G0/G1 phase cell cycle arrest and induces apoptosis in breast cancer cells.. Biomol. Ther. (Seoul). 26, 328-334. Martin, LJ (2010). Mitochondrial and cell death mechanisms in neuro-degenerative diseases.. Pharmaceuticals. 3, 839-915. Obrosova, IG (2009). Diabetes and the peripheral nerve.. Biochim. Biophys. Acta. 1792, 931-940. Obrosova, IG, Minchenko, AG, Vasupuram, R, White, L, Abatan, OI, Kumagai, AK, Frank, RN, and Stevens, MJ (2003). Aldose reductase inhibitor fidarestat preventsretinal oxidative stress and vascular endothelial growth factor overexpression in streptozotocin-diabetic rats.. Diabetes. 52, 864-871. Orrenius, S, Gogvadze, V, and Zhivotovsky, B (2007). Mitochondrial oxidative stress: implications for cell death.. Annu. Rev. Pharmacol. Toxicol. 47, 143-183. Park, JE, Piao, MJ, Kang, KA, Shilnikova, K, Hyun, YJ, Oh, SK, Jeong, YJ, Chae, S, and Hyun, JW (2017). A benzylidene-acetophenone derivative induces apoptosis of radiation-resistant human breast cancer cells via oxidative stress.. Biomol. Ther. (Seoul). 25, 404-410. Parsaeyan, N, and Zavarreza, J (2016). Evaluation of plasma protein oxidation biomarkers in type 2 diabetic patients with retinopathy.. Iranian J. Diabetes Obesity. 8, 203-207. Peng, Y, Liu, J, Shi, L, Tang, Y, Gao, D, Long, J, and Liu, J (2016). Mitochondrial dysfunction precedes depression of AMPK/AKT signaling in insulin resistance induced by high glucose in primary cortical neurons.. J. Neurochem. 137, 701-713. Perkins, CL, Fang, G, Kim, CN, and Bhalla, KN (2000). The role of Apaf-1, caspase-9, and bid proteins in etoposide- or paclitaxel-induced mitochondrial events during apoptosis.. Cancer Res. 60, 1645-1653. Rahimi-Madiseh, M, Malekpour-Tehrani, A, Bahmani, M, and Rafieian-Kopaei, M (2016). The research and development on the antioxidants in prevention of diabetic complications.. Asian Pac. J. Trop. Med. 9, 825-831. Shakeel, M (2015). Recent advances in understanding the role of oxidative stress in diabetic neuropathy.. Diabetes Metab. Syndr. 9, 373-378. Stevens, MJ, Obrosova, I, Cao, X, Van Huysen, C, and Greene, DA (2000). Effects of DL-alpha-lipoic acid on peripheral nerve conduction, blood flow, energy metabolism, and oxidative stress in experimental diabetic neuropathy.. Diabetes. 49, 1006-1015. Suhail, M (2010). Na, K-ATPase: ubiquitous multifunctional transmembrane protein and its relevance to various pathophysiological conditions.. J. Clin. Med. Res. 2, 1-17. Vincent, AM, Brownlee, M, and Russell, JW (2002). Oxidative stress and programmed cell death in diabetic neuropathy.. Ann. N. Y. Acad. Sci. 959, 368-383. Waldmeier, PC, and Tatton, WG (2004). Interrupting apoptosis in neurodegenerative disease: potential for effective therapy?. Drug Discov. Today. 9, 210-218. Winseck, AK, and Oppenheim, RW (2006). An in vivo analysis of Schwann cell programmed cell death in embryonic mice: the role of axons, glial growth factor, and the pro-apoptotic gene Bax.. Eur. J. Neurosci. 24, 2105-2117. Yang, YJ, Li, YK, Wang, W, Wan, JG, Yu, B, Wang, MZ, and Hu, B (2014). Small-molecule TrkB agonist 7,8-dihydroxyflavone reverses cognitive and synaptic plasticity deficits in a rat model of schizophrenia.. Pharmacol. Biochem. Behav. 122, 30-36.